This Statement was made to the New Forest National Park Authority at their meeting on 13th July 2017. Whilst we welcome the review of the RMS, the emphasis and approach of the survey used to launch the review process left much to be desired. You can’t promise the best recreational experience, or do a survey which at least in part is a call for a wish list for recreational interests, with the implication demand could be met, when you still haven’t determined what level of recreation is appropriate. The purpose of this exercise is to develop and implement a Recreation Management Strategy, not a Recreation Delivery Menu. 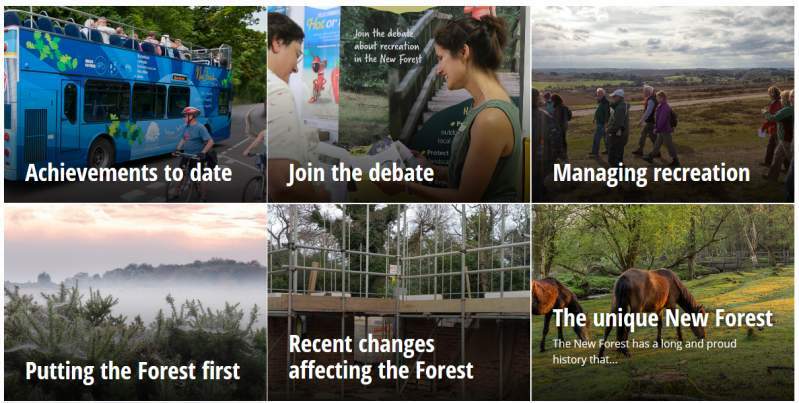 Apt messages on the “Putting the Forest First” page should have been incorporated into the survey where they might have a chance of being read. What we’d like to see first is an accounting on the current Management Strategy: which of the goals have had little or nothing done? Many targets are driven not by public demand, but from statutory obligations to the habitats and to the working Forest, and should not change. We need more focus on practical, achievable goals. The main way we can control where recreation happens within the forest is where people park and camp. The NFA hope to be able to support this Authority in its efforts to Manage Recreation, but we need to see a clearer indication of leadership that delivers the more difficult purposes of the Park, instead of focusing on the path of least resistance offered by the last and least, “enjoy”. With the then promised August publication of the Highcliffe to Calshot stretch of the England Coast Path (originally mooted for Feb 2017, — eventually delayed to March 2018), we highlighted some basic issues with the Path for the New Forest. Legislation has mandated the England Coast Path, which in other regions may provide useful alternative recreation, pleasant views and tourist destinations. For the New Forest it will serve to invite more disturbance into our most precious coastal habitats (a nearly uninterrupted series of highly designated and protected zones of international importance). The Ordnance Survey will inaccurately show spreading room (the entire seaward side of the path) as accessible, disregarding the need to delineate excluded areas (as much of our coast will be). Arguments will be had with visitors assured by the allegedly definitive map that they (and their pets) may trespass on bird nesting grounds regardless of what the signs say. We hope the authority will resist the worst excesses of this arbitrary unnecessary exercise. Please note, if time allowed I’d add many provisos pointing to some more positive examples of work which we support. We are disappointed in many of the failures to act on the current strategy. Despite the prescription from the SAC Management Plan for removal, we still have campsites destroying Ancient and Ornamental Woodland, the campsite survey showed these have less than half the canopy they ought, and this Authority’s Landscape Action Plan doesn’t even have the word campsite in it, let alone a consideration of their impact. Even a straightforward assessment of car parking provision, which we’ve spec’ed out as not particularly costly, has not been done. Credible enforcement of any rules developed, or even the existing byelaws, would require an investment in personnel that may not find funding, although we hope our support of the Ranger programme is a start. A huge wave of development is proposed on our borders, given little strategic consideration for the Park, unreasonable housing targets from Central Government for all local authorities, token mitigation which does not adequately reflect the value of the Forest, we’ve little hope for avoiding a substantial increase of recreational activity that will be dumped on the Forest. The Forest is under a palpable threat. So forgive us for not mincing words in pursuit of brevity. [*] Editor’s (sour) note : “the spectacular, yet fragile landscape which is a haven for many rare wildlife species” is a very underwhelming description for highly protected habitats and ecosystems – this suggests a pretty place that a handful of rare things happen to live in. The Forest is a mosaic of habitats, many of which have dwindled to nearly nothing in the rest of the UK. It is the entire precious fabric of these ecosystems which needs our protection, not merely a few birds and lizards. It is a last stand for many habitats and species. The full text, including the Addendum (not read to the Authority) was provided to Authority Members. Statements in the Public Questions section of Authority Meetings are limited to 3 minutes, even if multiple subjects are addressed. The statements are often necessarily terse, brusque and assume knowledge by the Authority Members of the issues addressed. Error: Error validating access token: Session has expired on Sunday, 10-Mar-19 01:16:56 PST. The current time is Tuesday, 23-Apr-19 11:43:10 PDT.